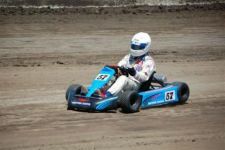 Our Goal at Cory Kruseman’s Sprint Car and Midget Driving School is to give the Fan or Race Car Driver some safe seat time and instruction in a Sprint Car or Ford Focus Midget. Our Team takes pride in teaching each student how to safely operate these race cars, from teaching you to dress in safety equipment to taking the checkered flag. We hope you will take this opportunity and come have the time of your life learning how to drive a race car.